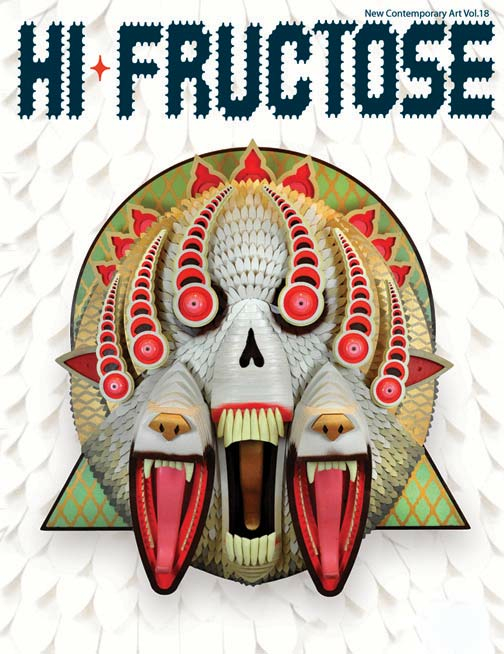 Our friends at Hi-Fructose have just posted a preview of their upcoming Vol. 18 with cover art by A J Fosik. Our first Hi-Fructose for 2011 kicks off with a screaming bang. With Hi-Fructose Vol.18 we explore the ever-evolving work of Tim Biskup, discover the catastrophic industrial landscapes of Jean-Pierre Roy, reveal the haunting portraits of Antonio Santin, the mind-altering graphic installations of FAILE, we travel to the third world with JR, showcase the paintings of Korin Faught, go behind enemy lines with the Billboard Liberation Front, and feature the sculpted deities of cover artist A J Fosik.